To be honest, I was extremely surprised to learn that Layla Zoe had already published 12 albums since 2005. I couldn’t catch Layla at this year’s Mahindra Blues Festival in Mumbai, where she performed to much acclaim, so Gemini is really the first time I got to hear her. In that respect, this review has been thus written as a discovery of a new voice, which it is, for me. Layla Zoe, as I discovered, is from Canada. Music started early in her life when she fronted for her father’s blues band. She has done a mix of studio and live albums over the past 12 years, since her debut album in 2006 (Shades of Blue). Gemini is independently produced with the help of crowd funding. In her campaign page on indiegogo, she writes, “I wanted to go back to a simpler, more pure method of creating and writing and recording.” So here we have it. … Layla is two sides of beauty and pain, fragility and courage, innocence and wisdom. A true Gemini. We start with CD 1, the softer, acoustic one. As the first notes of She Didn’t Believe come on, you are hit by a rich, full voice backed by classic bluesy guitar notes. It calls for engagement and you get drawn to it, looking up from whatever other tasks you may be doing. The song changes to I’ll Be Reborn Blues. There are shades of Woody Guthrie or Lead Belly in the guitar twangs. These two songs establish a certain sound that takes me back to the music of Joni Mitchell, Carole King and Bonnie Raitt. For a brief moment, I am trying to calibrate Layla using these legends as reference points. The songwriting is definitely in that direction. As is the vocalization. But then I stop. It’s unfair to do so. Instead, let’s see this for its own worth. I do have a preference for strong songwriting backed music. It’s the story inside a song that really interests me. Layla Zoe’s songs tell stories as well. The first two songs take you inside the world of a girl who is coming out of a relationship, hopefully stronger. Layla identifies herself with the protagonist using the term “firegirl” in the songs (Her second album in 2009 was titled The Firegirl). In this respect, there is a lot of “me” in the songs, quite akin to songs of Adele or even Alanis. In between, there are some diversions – Dark World features two young people caught up in the street trade; The Deeper They Bury Me visits the world of Herman Wallace, sentenced to solitary confinement in Louisiana State Prison for 42 years. When he was finally released in 2013, he was diagnosed with terminal cancer and died three days later. Then, a song that will interest Indian listeners, especially people from Mumbai, a song called Mumbai. The chaos of the city is described visually – “flowered trees” “jeweled feet” “floating debris” “in the market touching hips” and so on. The song is sung with the feel of a musical, not inappropriate for the city, a mega-theatre of drama for its citizens. But the singer seems to find some charm in all this “How could I forget this place” she croons. CD 1 rounds off with a song called Rainbow Pacmen and Unicorns. This might be one of the weaker songs in the set with lines like “Turn the music up loud in the bubble bath, so no one can hear you cry.” Some of these lines though are a bit jarring, breaking the thought process that one starts to build in the act of following the story of the song. As the album moves on to CD 2, we get riffs from Jan Laacks’ guitar and more vocal effort from Layla, rising above those riffs. Songwriting wise, there’s more introspection and reportage on herself. “You weren’t there for me – Miscommunication, blackouts, time – weakness, cowardice, oh and lies” she sings in Weakness. The guitar twangs are bluesy bringing in the ‘60s feel. The rest of disc carries on in the same vein, with Layla belting it out from her heart. So what’s the verdict? On the positive side, there is undeniably a freshness in the sound. There is definitely honesty and struggle put in to make good songs. You can clearly see the effort put in – creatively and technically (the production is quite clean). There is a distinct contrast, a good one, from the mainstream music titles churned out by some better known artistes. The one disappointment is that some of the songwriting needs to be more insightful, bringing in the mot juste effect. While one definitely empathizes with the artiste as she goes up the rollercoasters of her relationships, the self-identification in the songs can become a bit overwhelming. I hope that in her subsequent work Layla Zoe moves on to the next phase of her life. 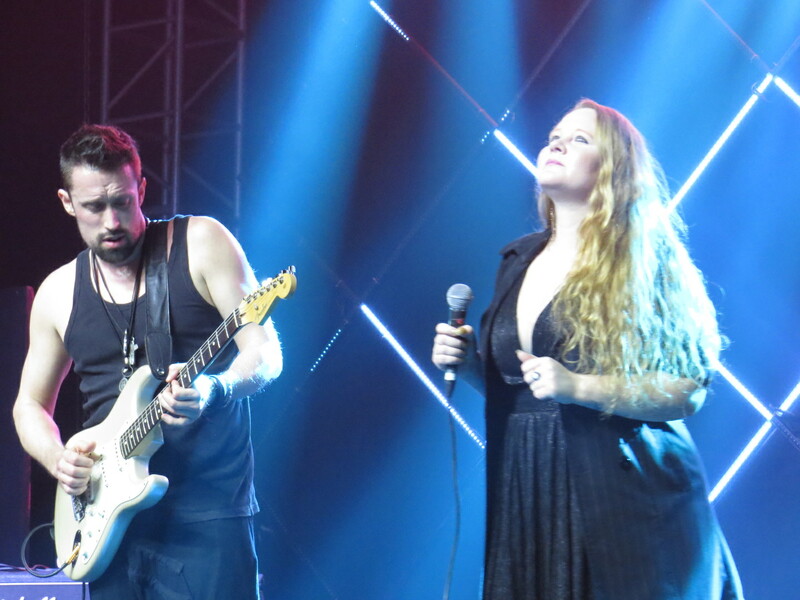 This entry was posted in Audio, Living Music – Festivals and More and tagged Blues, Blues Music, Layla Zoe, Mahindra Blues Festival, Mumbai, Rock.